There’s a war brewing…a war over hummus. That creamy delicacy of chickpeas, tahini, olive oil and lemon juice is at the heart of a dispute between Israel and Lebanon, both seeking to assert their claim over the dish. 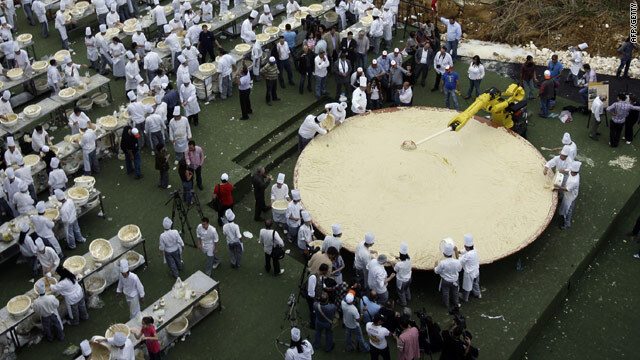 Saturday’s effort by Lebanon took the record back from Israel, which had made a four ton batch of hummus in October, an effort which had taken the back from Lebanon, which had taken it from Israel, ad infinitum. On the surface, this is simply a matter of international pride and rivalry. And the peaceful expression of the rivalry through cooking (or sport) is preferable to its expression through armed military conflict, as was the case in 2006 when Israel invaded Lebanon in an effort to seek out Hezbollah militants firing rockets into Israel. But there’s another element as well. The origins of hummus are disputed. Today, the dish is widely consumed around the world. Although the earliest verified reference to the dish dates to the eighteenth century, many assert it’s one of the world’s oldest foods. There are references to similar dishes in the Middle East dating back at least to the twelfth century. Records of chickpeas and sesame (the main ingredient in tahini) cultivation can be found dating to at least 2500 BC, and olive oil is discussed in the Bible. The origins of the dish, though, are disputed. In 2008, the government of Lebanon petitioned the European Union to classify hummus as a uniquely Lebanese food, granting it protected geographical status. Dishes like feta (Greek cheese) and Champagne (sparkling French wine) receive this protection. Other foods including Gorgonzola, Parmigiano-Reggiano, Melton Mowbray pork pies, and Asiago cheese, are also protected. The mark is intended to offer a form of intellectual property protection for the label, promoting the product by giving consumers specific information regarding the origin of the product while simultaneously providing a mechanism to facilitate rural development. According to the Lebanese government, humus is a uniquely Lebanese dish and the name should therefore be protected. Like with feta cheese, which can only be called feta if produced in Greece and which must otherwise be called “Greek-style cheese” or something similar, the Lebanese government is asserting its claim that only Lebanese hummus is really hummus. At stake is a $1 billion international market for the product. But there are also questions of nationalism and of national pride. The Lebanese claim that Israel is “stealing” their country’s national dish…along with several other national dishes, including falafel, tabbouleh, and baba ghanouj. The success of Israeli-manufactured hummus in European Union markets likely led to the assertion of Lebanon’s claim. But the specific manifestation of the claim, particularly in the context of the longstanding military tensions between the two countries, takes on a much deeper and more powerful meaning. Think about that next time you have that hummus. The death of Michael Jackson dominated news coverage this week, pushing other major developments aside. Indeed, with so much popular interest generated that popular sites like Twitter and Facebook were overwhelmed with traffic and unable to keep up with bandwidth demands. By Sunday morning, networks were slowly returning to other coverage. 1. British Foreign Secretary David Miliband issued a statement expressing “deep concern” over the decision of the Iranian government to arrest eight local employees working in Tehran. The eight Iranian employees at the British embassy were charged with involvement in the ongoing protest over the outcome of Iran’s presidential elections. The arrests follow developments last week in which Britain and Iran each expelled two of the other’s diplomats. The arrests (and the continuing deteriorating relationship more generally) will likely be a topic for informal discussions at the G8 meeting this weekend. 2. Meetings between NATO and Russian foreign ministers over the weekend set the stage for greater cooperation in Afghanistan, counter-terrorism, and nuclear proliferation. Relations between Russia and the west had deteriorated after the Georgian war last year. The Russian government also announced plans to restructure the country’s military. 3. Taro Aso, Japan’s prime minister, is facing increasing pressure to resign from his post ahead of general elections which must be held by October. Aso’s ruling Liberal Democratic Party of Japan has dominated post-war Japanese politics, ruling the country for all but 11 months of the last 53 years. But Japan’s ongoing economic crisis, combined with allegations of corruption and political infighting within the LDP, has led to a sharp decline in popular support for the party—and a potential radical shift in Japanese politics, with the opposition Democratic Party of Japan poised to seize the opportunity. 4. Lebanon’s new prime minister, Saad al-Hariri, has begun the task of forming a new parliament for the country. Hariri won a surprising victory over rival Hizbollah last month, but now faces the daunting task of uniting Lebanon’s three rival factions, the Sunnis, Shi’as, and Christians. In order to maintain good relations between Lebanon’s three factions, Hariri has proposed to establish a government of national unity. (glossary) But Hizbollah has so far refused to accept the possibility of a unity government unless it is granted veto power, a development which Hariri opposes. 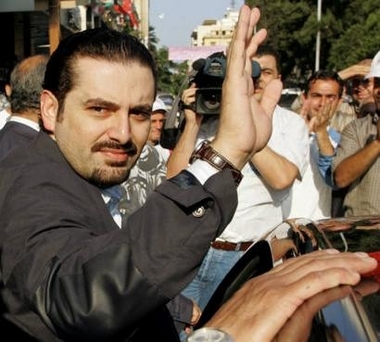 Hariri was the favored candidate of the United States and Saudi Arabia, but was sharply opposed by Syria. Stable relations between the three countries are seen as vital to the maintenance of peace and stability in Lebanon. 5. Human Rights Watch accused the government of Zimbabwe of engaging in murder, forced labor, and torture in its diamond mining operations in the Marange district in the eastern part of the country. The accusations come shortly after a campaign by the country’s prime minister, Morgan Tsvangirai, failed to secure the western economic aid it had hoped for. Zimbabwe faces considerable challengesin its attempt to address the ongoing economic and political crisis which has plagued the country for more than a year. While inflation has come down from its record 231 million percent last year, the political standoff between President Robert Mugabe, who has ruled Zimbabwe since its independence in 1980, and his political rival, Prime Minister Tsvangirai, remains unresolved. Headlines this week have been dominated by two stories: Michael Phelps’ success at the Olympic Games and the Russia-Georgia War. With all the attention paid to these two stories, here are five other developments you might have missed. 1. Russia’s Poland Threat: After Russia’s move into Georgia last week, Poland decided to permit U.S. interceptor missile bases to be housed there. The bases, part of the Bush Administration’s strategic defense initiative program, had been frozen due to American resistance to Polish demands that a Patriot missiles battery be stationed in the country as part of the deal. After the Georgian conflict, the United States appeared willing to give in to the Polish demand. In response, Russia warned Poland that it was now a target for their nuclear arsenal. 2. Musharraf’s (Possible) Resignation: Facing possible impeachment, Pakistan’s President Pervez Musharraf indicated on Thursday that he will be stepping down. Impeachment proceedings had been set to start early next week. Musharraf’s resignation was likely intended to avoid that spectacle. As part of the agreement, Musharraf will avoid prosecution and will be permitted to remain in Pakistan. His departure, however, signals an important shift in Pakistani politics, a key country in the war on terror. 3. No Diplomatic Solution in Zimbabwe: Negotiations intended to resolve Zimbabwe’s longstanding crisis have so far failed to reach a peaceful settlement. At issue is who will lead Zimbabwe. Robert Mugabe, the current president, has been in office since 1980 and has increasingly relied on force to maintain his rule. Morgan Tsvangarai, leader of the opposition Movement for Democratic Change party, won the first round of presidential elections last March before being forced to cancel his campaign in the second round of voting due to political violence. Despite extensive pressure being placed on the country by South Africa, Mugabe appears so far to be unwilling to share power. Negations continue, but few are hopeful that a settlement will be reached. 4. Lugo Wins Paraguay Election: Continuing a leftward shift in many Latin American countries, Fernando Lugo won the election in Paraguay, marking the end of 61 years of one-party rule by the Colorado Party. One of Lugo’s first acts as President was to decline his monthly salary of approximately $4000, declaring that “the money belongs to the poorest.” Evo Morales, the leftist President of Bolivia, said that Lugo’s victory would “deepen democracy” in the region. 5. Syrian-Lebanese Meeting: In the face of a declining security situation in Lebanon, the country’s President, Michel Suleiman, agreed to re-establish full diplomatic relations with neighboring Syria. The agreement, part of a package that seeks to normalize relations between the two countries, marks the first time the countries would exchange ambassadors since both achieved independence in the 1940s.